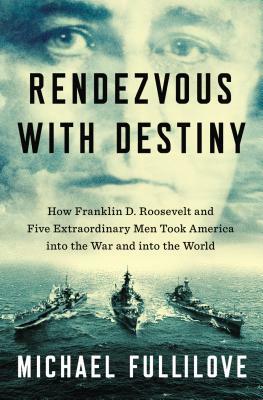 "The remarkable untold story of Franklin D. Roosevelt and the five extraordinary men he used to pull America into World War II"
In the dark days between Hitler's invasion of Poland in September 1939 and Japan's attack on Pearl Harbor in December 1941, Franklin D. Roosevelt sent five remarkable men on dramatic and dangerous missions to Europe. The missions were highly unorthodox and they confounded and infuriated diplomats on both sides of the Atlantic. Their importance is little understood to this day. In fact, they were crucial to the course of the Second World War. The envoys were magnificent, unforgettable characters. First off the mark was Sumner Welles, the chilly, patrician under secretary of state, later ruined by his sexual misdemeanors, who was dispatched by FDR on a tour of European capitals in the spring of 1940. In summer of that year, after the fall of France, William "Wild Bill" Donovan--war hero and future spymaster--visited a lonely United Kingdom at the president's behest to determine whether she could hold out against the Nazis. Donovan's report helped convince FDR that Britain was worth backing. After he won an unprecedented third term in November 1940, Roosevelt threw a lifeline to the United Kingdom in the form of Lend-Lease and dispatched three men to help secure it. Harry Hopkins, the frail social worker and presidential confidant, was sent to explain Lend-Lease to Winston Churchill. Averell Harriman, a handsome, ambitious railroad heir, served as FDR's man in London, expediting Lend-Lease aid and romancing Churchill's daughter-in-law. Roosevelt even put to work his rumpled, charismatic opponent in the 1940 presidential election, Wendell Willkie, whose visit lifted British morale and won wary Americans over to the cause. Finally, in the aftermath of Germany's invasion of the Soviet Union, Hopkins returned to London to confer with Churchill and traveled to Moscow to meet with Joseph Stalin. This final mission gave Roosevelt the confidence to bet on the Soviet Union. The envoys' missions took them into the middle of the war and exposed them to the leading figures of the age. Taken together, they plot the arc of America's transformation from a divided and hesitant middle power into the global leader. At the center of everything, of course, was FDR himself, who moved his envoys around the globe with skill and elan. We often think of Harry S. Truman, George Marshall, Dean Acheson, and George F. Kennan as the authors of America's global primacy in the second half of the twentieth century. But all their achievements were enabled by the earlier work of Roosevelt and his representatives, who took the United States into the war and, by defeating domestic isolationists and foreign enemies, into the world. In these two years, America turned. FDR and his envoys were responsible for the turn. Drawing on vast archival research, "Rendezvous with Destiny" is narrative history at its most delightful, stirring, and important. MICHAEL FULLILOVE is the executive director of the Lowy Institute in Sydney, Australia, and a nonresident senior fellow at the Brookings Institution in Washington, D.C. A Rhodes scholar and former prime ministerial adviser, he writes widely on global issues for publications such as the "New York Times, "the "Financial Times, "the" Daily Beast," and "Foreign Affairs."